but I am now hiding my writing in lots of places. That way they won't realise how much nonsense I am posting out there. Here is the post I wrote for Jason Robillard from the "The Barefoot Running University". A love letter to Trail. I have a big case of mental block at the moment. Usually a couple glasses of wine and an insane day is enough for me to splurt nonsense, however this hasn't been happening. I sit looking at the computer, blankly wondering what event I can drag out of my mundane life and then somehow make it interesting. In the last week I have now discovered there is something called "Justin Bieber" (Sp? ), but still don't understand it's role in the universe - or why it's hair-cut is so important. Anyone know what this thing is and why it's needs dedicated news reports on it's hair? After investigating - yes I have been that desperate - I am still at a loss. Anyone? I have found random web-sites that are of no use to me - or anyone else I can see, yet I will spend my days plowing through them instead of actually siting down and writing. I have managed to catch up on all my friends blogs - which is unheard of. I am even whittling down my "to-do" list and yet, the blank "New Post" page on blogger blinks at me. Why the sudden evaporation of stupid thoughts and ideas? I think it's nerves. 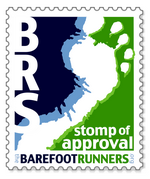 I have been asked - along with many others - to write a few posts for my friend Jason Robillard at the "Barefoot Running University". This is a big surprise, an awesome opportunity and one I am so grateful for. I still personally think he doesn't know what he is letting himself into. I mean, my contribution to the Internet is inane at the best of times. Honestly I think he must have had one too many of those purple cocktails drinks with the little umbrellas and the fake pink flamingo olive sticks... Actually, do those fake pink flamingo olive sticks exist? Now I have written that I am not so sure - let me get a patent on that quick, it will make me millions! Initially I was brimming with idea's. On my run's I began to think of posts I could write: How running should be about life, but not the other way around; My love to run trails; How I fit in running with my life. They were just coming out of my head. Then I made the mistake of trying to tackle the task as if it were a college essay. I would plan, organise, create notes - in fact I would do this in a grown-up and methodical fashion. This is where it all failed. My posts morph from the title and I just sit there and type. Usually with a mug of wine, (yes Mug, I am one classy lady) and my local radio station playing over the internet. I don't really consider paragraph headings, or introductions, summaries or citations. Heck, if it wasn't for an automatic spell-checker the posts would be unreadable. So there I was sitting at a open document page wondering what the heck to write. The pressure began. I wanted to write something cool - Jason's a cool guy, how could I write anything less. But I don't do "cool"... Bugger. Jason didn't specify times or topics. No time-frame. That's a killer to start with. I could actually win awards for my level of procrastination, if I could be arsed. I don't just wait for due-dates, I wait for three days after the final red-letter and the threats from big guys with mallets. I will provide an example. It's nearly March and I still have Christmas parcels on the dining table that needs to be shipped internationally. We aren't talking presents to vague acquaintances, we are talking presents to immediate family! I have still to write the Christmas cards from last year. I make it a standard joke that I am 7 weeks behind on life. Everyone titters, how they would laugh if they actually realised, I am NOT joking! I don't organise my life on dates on a calender, I just organise my life as a "Sun-Sat" affair. Why? because in my head it's still the second week in January. Then the pressure to think of a great running topic began. "Running whilst hiding the snot-streaks"? Nope - that's going to appeal to, well maybe just me, and anyway my other friend AngieB and Jason's wife, Shelly have that part of running covered a little too well already. "How to run barefoot?" Heck, no - Jason wrote the book (literally) and I am a novice in comparison. "How to run quicker, better, further?" I am a person who's idea of a training schedule is checking the inaccurate weather forecast and seeing how far I can go before the usual Vancouver rain drenches me. "Cross-training" - what's that? (learning how to be a transvestite?) I think you can see my problem here. When I tried to examine an aspect of running (and Barefoot/Minimalist running in particular) I felt that I was either un-qualified, inexperienced or there was somebody better at the topic than me. So here I am. I am in a better situation than I was 40 mins ago, (I no longer have a blank "New Post" screen). I do still have my initial problem though; what can I write for Jason that will be interesting, informative, cool and inspiring - oh and about running? *slaps face* This is where we look to our strengths and unique talents. I've got it! I know something I can do better than anyone else. Why did I not think of this before? This post is a little technical. I tried to make it as easy to read as possible, but I am having trouble. In ABA teaching with children with Autism, teaching of new skills needs to be done with a understanding of basic behaviour. Most teaching of new skills is done with re-inforcers, (something a child wants). There are two different types of re-inforcers. Primary - These are the basic needs we all need. So therefore, food, drink and sleep. Of course we can't use sleep as a re-inforcer, so as a primary re-inforcer we can only rely on food or drink. Secondary - These are learnt re-inforcers and are not instinctive. Physical objects (toys) and preferred activities fall under this section. Social interaction (usually praise), also falls into this section, but quite often children with ASD have no desire to make social connections, so this is a hard re-inforcer to use. During typical child development a child will build a connection with the primary and secondary re-inforcers. A baby will like to have milk (primary) and will use negative re-inforcement on the parents to get it. (i.e. baby will scream for milk and won't stop until they get it). The baby will also associate being held by the parent (social/secondary) with being given milk and over time a connection between the primary need and the secondary need will be made with the child. Eventually, the association of person giving the milk (love, happiness) will be present even if the milk is not present. With children with ASD there is not this automatic association between the primary and secondary re-inforcers and this connection takes a LOT longer to learn. This is one reason why children with ASD may not respond to a "good job" comment when they practise a preferred behaviour. You will find in teaching new skills to a child with ASD that food is quite often used as re-inforcer. It will be accompanied by a "Well Done", but essentially the child is after the candy! :D Eventually however, the child WILL learn the connection between the primary and secondary re-inforcer so eventually a "Well Done" will be enough. In modifying behaviour we can use either Positive or negative re-inforcers, OR positive or negative punishment. Understanding the differences between them is essential to see why they do or don't work (with most kids not just those with ASD). Positive re-inforcement - This re-inforces a preferred behaviour by giving the child something he/she wants. Giving the child candy for doing something you want. Negative Punishment - The intention is to increase a preferred behaviour by giving something the child dislikes. Spanking/hitting is an example. Re-inforcement occurs during a behaviour, where-as punishment occurs after a behaviour. Re-inforcement of a behaviour (wether it is positive or negative) will increase a desired behaviour, Punishment (both positive and negative) will not increase a desired behaviour over a period of time. It will INCREASE an UN-DESIRED behaviour. When a child performs negative re-inforcement on us; i.e. screaming for a toy in a store, and we give-in, we are actually positively re-inforcing the behaviour. This is more so if the toy is given after a delay, or intermittently. To explain, a child screams for a toy. You will say, No for the first 5 mins. The lack of response will cause the behaviour to increase. Eventually you have enough and you give in. The child stops screaming. The child has performed "negative re-inforcement" on you. She was doing something you didn't like, but stopped when you did what she wanted. In the future, the child will remember this. So therefore will do exactly the same again. You have positively re-inforced her behaviour because you have shown her that 'screaming works'. If you do it intermittently, then the child will scream every time you go to the toy store because she knows that there is a percentage chance the screaming will work, which is better than nothing. The same works both ways. The best way to create a desired behaviour is to positively re-inforce it. It is the most consistent and creates a increased self-esteem (if you are able to use social re-inforcement). Behavioural/Functional Analysis, is the way of identifying the reason behind a behaviour so that it can be shaped or altered. In children with ASD we have to constantly do a behavioural analysis because many of the children will not be fully verbal, or if they are verbal, may become uncommunicative under stress. There are some important facts we need to know before we start. A lot of the "Protest" behaviours are because the demands on the child is too much. Escape/Avoidance/Protest - "I DON'T WANT"
Once we have examined the setting events, the trigger and evaluated the behaviour, we can perhaps come to a conclusion as to why the behaviour happened. We can begin to understand why the child behaved as he/she did. Once we know the cause of the behaviour we can put plans in place to modify the behaviour to something or create aids, that are beneficial to the child. We all require visual aids, not just Autistic children, or even Neuro-typical children. There aren't many of us that cannot survive without a calender, diary, address book or notebook. These are all visual aids that help us in our day-to-day lives. People with Autism however, are less able to function without visual aids and there are many reasons for this. Firstly, Autistic children have poor informational processing. This leads to poor memory. When there is also poor information processing there is also increased anxiety, because you are less able to remember/predict/understand what will be happening next. (This is why Autistic children have a preference for "sameness", it makes life a little easier for their information processing system). Having a visual schedule or scripted routine elliminates the need to rely on a faulty information processing system. Second, as mentioned in the communication blog, verbal communication is transitory. Once something has been said it is gone and the information will only be available again IF the person decides to repeat the sentence. As many children with ASD also suffer from a processing delay, then this can mean the request is misunderstood or not acted upon. This again can create anxiety, because the child cannot be confident that they have the correct information. Visual information is NOT transient and can be access when the child needs to. Visual aids reduce the need for Verbal prompts by the caregiver. Visual prompts (maybe a "handwashing routine") means that a child can perform the task without having to be prompted verbally every stage. Visual aids increase independence and reduce "learned helplessness" (as with verbal prompting - "learned helplessness" is when a child will wait for a prompt before continuing the task and will be reluctant to do any stage of the task without a "usually" verbal prompt). Countdown strips: a way of visually showing the time till a task is to be completed; helps with transitional situations. "You have 5,(4,3,2,1,) minutes till you are all done"
Social stories; a visual way to show a child what he/she should do in a social situation - a way of learning the social rules. Allows the accomplishment of large goals. Please don't take my visual schedule away! We have to remember that the fading out of the visual aids should be dictated by the CHILD and not the adult. Just because the adult believes the visual aid shouldn't be used anymore, doesn't mean the child still isn't using it. Apart from visual schedules, on of the main visual aid is the "Picture Exchange Communication System (PECS). This is a way for a non-verbal child, (or a verbal child who has decreased language because of an overwhelming environment) to be able to communicate their needs. It has been shown that instead of hindering language, the PECS system actually facilitates the growth of language. Please see the communication blog regarding "communication and language" in Autism. Below are some of the links and books recommended by the lecturer from my 'POPARD Introduction into ASD - practical applications' course. I'll update the list when I get more info. Defeat Autism Now. There is a list of doctors and specialists. POPARD is the outreach program for Autism in BC. They run the course I am on. They have good resources in the E-learning section. This video was created to show what it is like for an Autistic person who has auditory and visual sensory integration issues. It's only 11 minutes long and it makes you realise what it must be like for people who have to deal with this all day, every day. SetBC- There is a section called 'PictureSet' which has pre-made .pdf and boardmaker visual prompts. ACT BC the Autism department for BC, Canada. List of qualified practitioners in BC. Sensory Integration- "The out-of-Sync Child" by Carol Stock Kranowitz (The go to text about what SPD is and what you should expect). Sensory Integration-The out-of-sync child has fun" by Carol Stock Kranowitz. (The techniques on how to create a sensory diet). Emotional regulation- "The incredible 5 point scale" by Kari Dunn Buron. Social Thinking- "The New Social Story Book" by Carol Grey. (A book with all stories on a CD so they can be altered to suit the situation/child. This book gives 150 social stories that teach social skills for varying situations. I brought this one to as D is high-functioning and reading social-situations is one of his difficulties). Anxiety- "Meet Thotso, your thought maker" by Rachel Robb Avery. (I brought this one because D was starting to suffer from Anxiety and I wanted to show him it was okay and how he could change his thinking. It's a board book with "lift the flap" and removable items. Kind of fun).